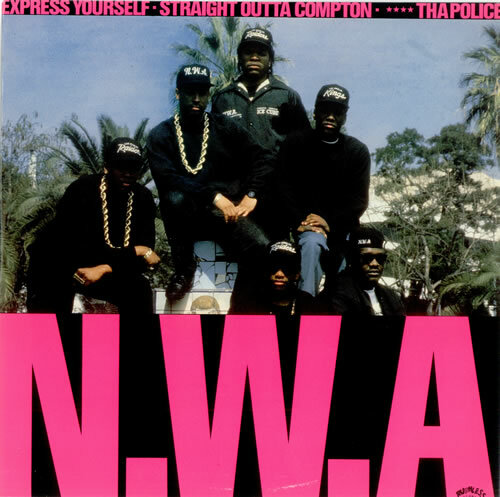 Song of the Day: ‘Express Yourself’ by N.W.A. So, I’ve never thought of myself as a particularly aggressive person. But lately I’ve realized that there are actually a lot of things that I rant about, and my rants seem to be increasing in their rate of occurence. I hung out with Donkeysuit last night and he agreed that I seem more fired up than usual. I’m not entirely sure why this is, but I think it might have something to do with the fact that I’m writing more which in turn is making me think more, about everything (not just music). It’s not entirely unpleasant, to be honest with you. I’m enjoying having an outlet for my thoughts, and if it’s spilling over into my daily life (i.e. when I’m talking to actual humans rather than banging away on a computer keyboard) then that’s cool too. Look, I’m sorry, but I don’t know why anyone out there is remotely surprised that it came to this. Phil Spector had been pulling guns on people for years, people. YEARS. And then he finally went and murdered someone. Yeah, law enforcement officials, couldn’t have seen that one coming. Why didn’t someone lock this man up before he started offing people? The signs were all there. A LIFE COULD HAVE BEEN SAVED. I don’t care that it costs more to take the subway in Toronto than in New York freaking City. I don’t even care that sometimes I’ll be waiting for a streetcar in the freezing cold depths of winter for over half an hour, and then 10 will show up in a row. Those things annoy me, sure, but not as much as the complete lack of customer service exhibited by some of the TTC’s operators, some of whom are honestly so unpleasant that I don’t even know what to say about it. Look, I get it, TTC drivers — you’re exposed to the drooling, unwashed masses all day. I don’t doubt that can be extremely annoying. But it is, in the end, part of the job. Here’s the deal: when you see someone wearing sweat pants, it is a sure sign that they have pretty much given up on life. I’m not talking about the cute Lululemon exercise pants or those flashy Adidas track pants & whatnot. I’m talking about the grey sweatpants, the ones with elastic around the ankles. These are only acceptable on little kids and very old people (on whom they look awesome). When it comes to everyone else…c’mon, just pull your lives together, people. Whatever it is, it can’t be that bad. Tell your friend Spencer about it, maybe I can help. Just stay away from the sweat pants. In the past few years I’ve been to Chicago and Boston. You know what those two cities have in common? Amazing waterfronts. I would like to know who the jackass was that totally screwed up the planning of the Toronto waterfront. It doesn’t even feel like we live in a city on a lake. Seriously. There is so much wasted potential here it makes me want to cry. Sidenote: I know it seems like I’m complaining a lot about my city. I don’t hate it here, in fact I love it, which is why it frustrates me to see a few major areas of city life that are sorely in need of improvement. Anyway! All of these thoughts rattling around in the old brain have gotten me thinking about the importance of being able to say what’s on our minds, regardless of whether it’s positive or negative, especially when it’s critical or controversial. I don’t know about you guys, but I feel like in some ways there’s been a subtle constriction on freedom of speech in the last couple of years. Is it just me? I mean, why doesn’t facebook have a “dislike” button? Maybe sometimes I don’t like what you’re saying. I should have the right to tell you that, shouldn’t I? It’s not like I’m going to be a total jerk and argue with you about everything. We can handle it if we don’t agree, right? Can we? Maybe we can’t. Maybe that’s what all of this is leading to — people who get totally bent out of shape when they’re told “no” instead of “yes”. But if all we’re doing is going around patting each other on the back then we are not challenging one other and fostering critical thought. *Actually, this quote is often mistakenly attributed to Voltaire. It was, in fact, his biographer who said it about him, as an example of the beliefs that he espoused. This is why I’ve chosen N.W.A.’s ‘Express Yourself’ as my Song of the Day. These guys obviously had no compunction about speaking their minds. Somewhat ironically, this is pretty much one of the only N.W.A. songs that doesn’t contain lyrics that are violent, mysogynistic or profane in nature, and thus wouldn’t have been censored for radio play. If I really wanted to drive home my point about freedom of speech then I guess I could have chosen ‘F*ck tha Police’ or something of that ilk, but y’know what, this is a great song and it speaks to the topic at hand. *There’s no video for this one, obvs. But please enjoy this photo of N.W.A. posing with firearms. And now, it’s your turn. What’s got you ranting these days? Tell us all about it.